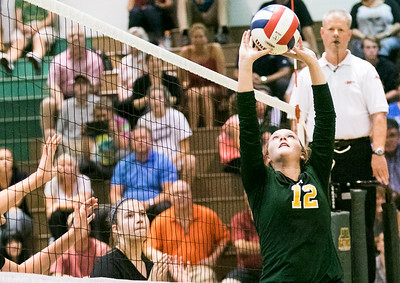 Sarah Nader - snader@shawmedia.com Crystal Lake South's Emily Slimko sets the ball during Thursday's match against Crystal Lake Central September 8, 2016. Central defeated South, 25-23, 25-12. Sarah Nader - snader@shawmedia.com Crystal Lake Central's Camryn Hausler jumps to block a ball during Thursday's match against Crystal Lake South September 8, 2016. Central defeated South, 25-23, 25-12. 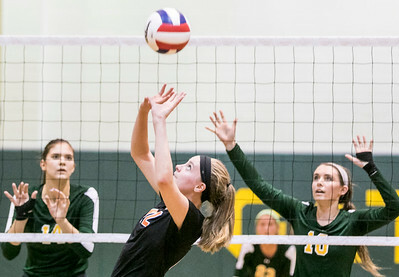 Sarah Nader - snader@shawmedia.com Crystal Lake Central's Megan Kelly (center) sets the ball during Thursday's match against Crystal Lake South September 8, 2016. Central defeated South, 25-23, 25-12. 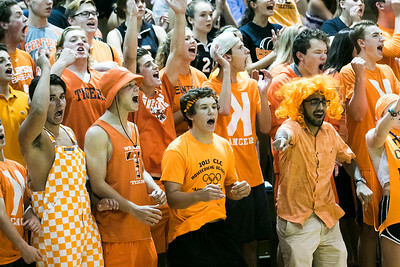 Sarah Nader - snader@shawmedia.com Crystal Lake Central fans cheer in the girls volleyball team during Thursday's match against Crystal Lake South at Crystal Lake South High School September 8, 2016. Central defeated South, 25-23, 25-12. Sarah Nader - snader@shawmedia.com Crystal Lake South's Kleja Cerniauskaite hits the ball over Crystal Lake Central's Madelyn Blake during Thursday's match at Crystal Lake South High School September 8, 2016. Central defeated South, 25-23, 25-12. 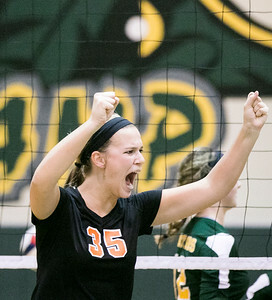 Sarah Nader - snader@shawmedia.com Crystal Lake Central's Madelyn Blake celebrates a win during Thursday's match against Crystal Lake South September 8, 2016. Central defeated South, 25-23, 25-12. 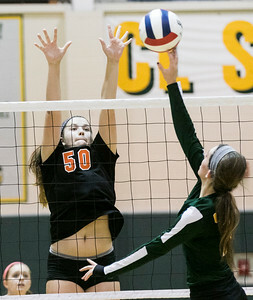 Sarah Nader - snader@shawmedia.com Crystal Lake Central's Megan Kelly (left) sets the ball during Thursday's match against Crystal Lake South September 8, 2016. Central defeated South, 25-23, 25-12. 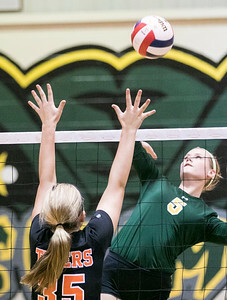 Crystal Lake South's Kleja Cerniauskaite hits the ball over Crystal Lake Central's Madelyn Blake during Thursday's match at Crystal Lake South High School September 8, 2016. Central defeated South, 25-23, 25-12.